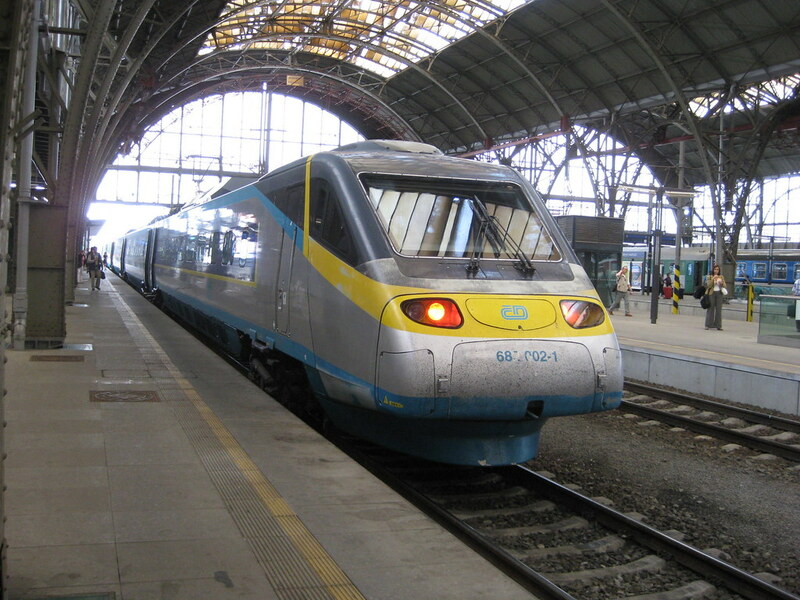 Czech Pendolino train in Prague main station. I went to the Urban Track Project final conference in Prague because I am helping the Wiener Linien (Vienna’s public transport operator) on a research project intended to better understand the motivation for implementing good maintenance procedures. The conference presented results of the four year research project on how to design and build better urban rail (streetcars, metro, subway, etc.) track work. Several of the presentations were about how to design slab track to reduce noise and vibration. Since I am more of a planner than engineer a couple of the less track-engineering presentations were more interesting for me. These were on: green track, rehabilitation processes and socio-economic impacts of rehabilitation projects. 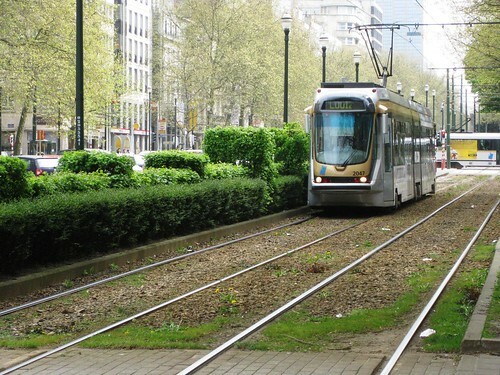 The Green Tram Tracks, The Advantages of Implementing Vegetation Systems in Tram Tracks presentation was by Henrikje Schreiter from the Institute of Agricultural and Urban Ecological Projects (IASP) in Berlin. She described her phd dissertation on the benefits of using a specific plant species (Sedum, which is a succulent plant) for green tracks. In summary, there are a lot of benefits including water retention, reducing noise (small, but something), reducing airborne particles and just creating a nice visual environment. She discussed lots of the practical reasons why Sedum is a good choice (e.g no need for mowing) and how you actually build these systems (e.g. building them so that emergency vehicles can drive over them). The IASP is holding a seminar on the subject of green tracks (German) – who knew that Berlin has been using green tracks since the early 1900s? 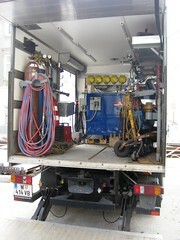 – on 20 September 2010 (before the Innotrans Exhibition). The seminar is in German, but I may try to go and can do some translation of interesting presentations. Several speakers talked about rehabilitation of tram tracks. 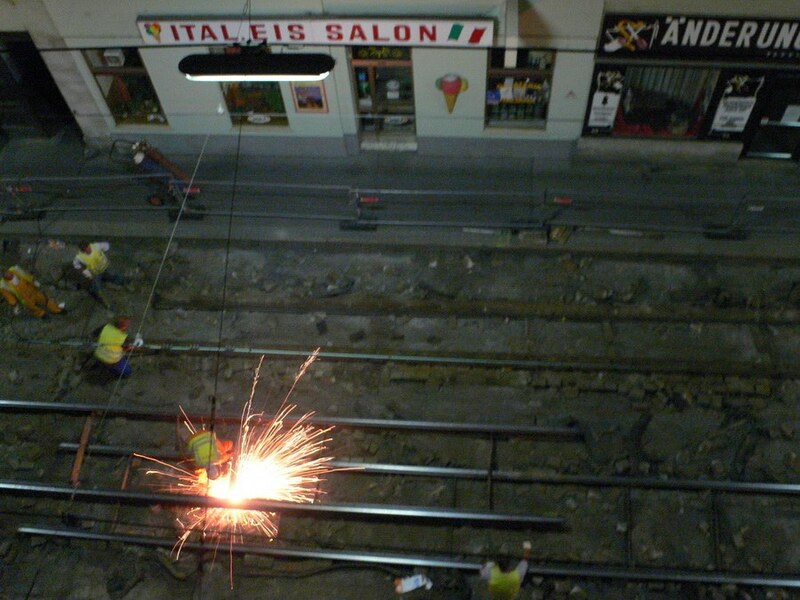 As visitors to my website know, tram track rehabilitation is a subject close to my heart! Speakers described a replacement project in Bremen where the tram service was only stopped for a weekend (although roadway traffic on the adjoining lanes was stopped for four weeks) for a traditional tram track replacement project, and one in Karlsruhe, where the city took about three weeks to install pre-fabricated track slabs in a historic district. The contrast between the two projects was quite interesting. 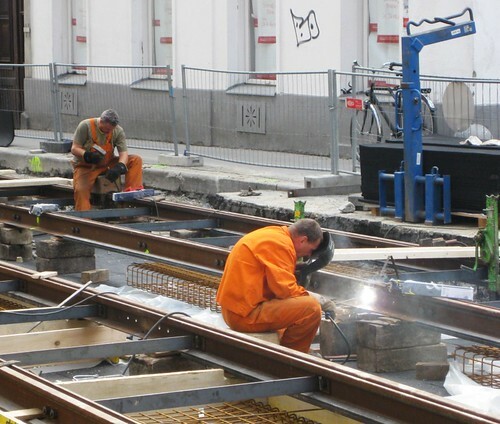 In Bremen the goal was to minimise service disruption and in Karlsruhe the goal was to install historic-looking track as efficiently as possible. In the project area Karlsruhe’s track is set in cobble stone pavement, so the prefabricated sections had a cobble stone surface. Also interesting was the fact that the work was done under the catenary lines – which made it difficult to manoeuvre cranes and lifting equipment. Both projects were partly funded by the Urban Track project and lots of practical lessons were learned. The final presentation I will talk about was by Marjolein de Jong from Hasselt University in Belgium. The presentation was on evaluating the socio-economic impacts of tram track rehabilitation projects. What I found so interesting about her research was how systematically she identified the potential impacts and her findings regarding various potential staging strategies. When I talked to her later she said, well it’s just impact analysis 101, but I think it’s important because it starts to develop an organised framework for thinking about some of the problems planners face when considering rehabilitation programs. More information about the project is available on the UrbanTrack project website. 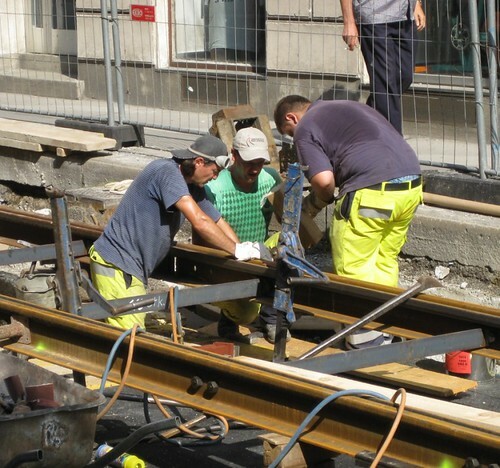 As I mentioned in previous posts the Wiener Linien has been rebuilding the tram tracks in our neighbourhood this past month. I am putting lots of the photos on my website and also several movies. I now have five movies of the construction process on YouTube, above is one of them. 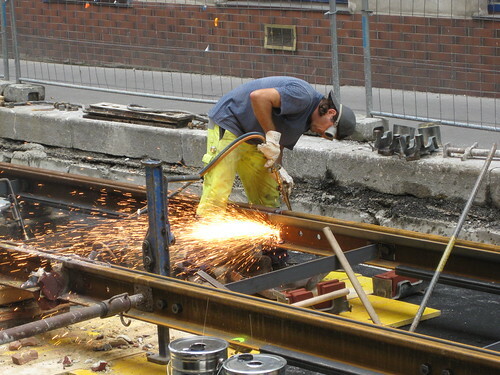 I will write another post when the Westbahnstrasse Tram Track Reconstruction website is finished. 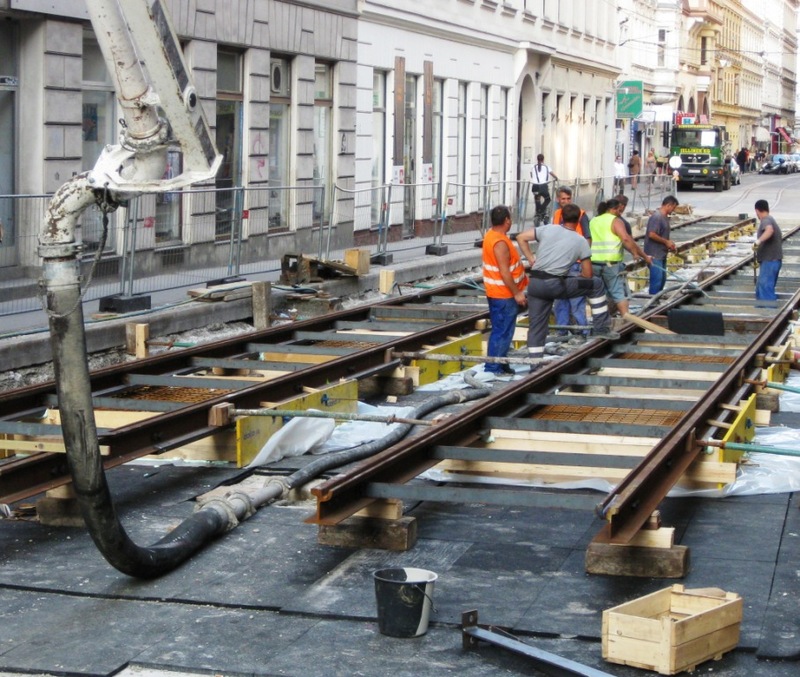 I’ve been working on my website pages that illustrate the reconstruction of the tram tracks on Westbahnstrasse (Vienna) near our house. The project is almost over and has been fascinating to watch. 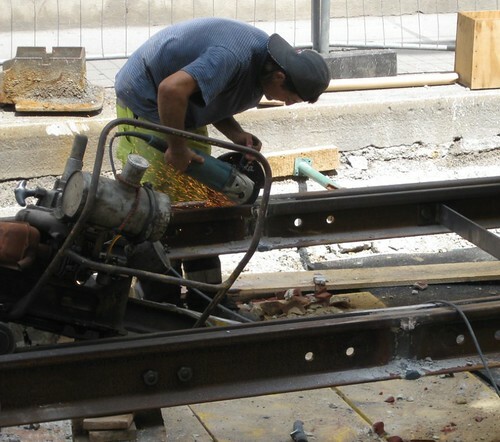 Here’s my Westbahnstrasse Tram Track Rehabilitation page with information on all my track rehabilitation project posts and photos. Welding track makes the ride much smoother (no clickity-clak) and helps reduce wear on the wheels; reduced wear on the wheels means less track maintenance, it’s one well-connected system. Here are photos of the track placement process. Overhead photo from a neighbour. 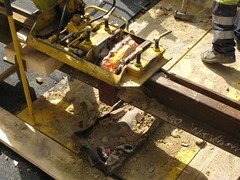 The photos below show several steps in the process of filling a joint and then breaking away the excess steel. See the film below to view the whole process. YouTube video showing the process of filling a joint, grinding the rail and a small bit of welding. 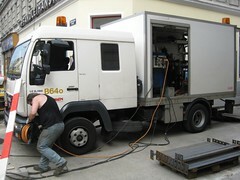 Here are the Wiener Linien welders working on another section of track and the Wiener Linien’s welding truck. Back to Westbahnstrasse Tram Track Reconstruction 2009 Homepage. In addition to taking photos of the construction process, I also made several videos. This page presents the five videos. The first step in the reconstruction process is to demolish the street and remove the tracks. This video shows some of the street demolition process. This video shows some of the work done on preparing the track. 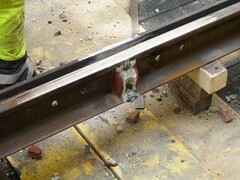 It includes on joining the rails, grinding the rail joint and welding the rail. This video shows how the workers built the support structure for the rails out of concrete. 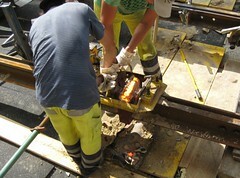 After building the concrete supports, the workers removed the wooden supports and built the subsurface under the rails. This was done by section. This video shows the workers pouring concrete to build the substructure. The final step in the process was to rebuild the street surface. This video shows the two methods used to finish the surface: placing prefabricated units and pouring a new surface.